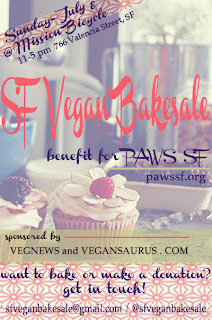 Eats Well With Others: The Vegan Bake Sale is Coming!!!! The Vegan Bake Sale is Coming!!!! ONE WEEK PEOPLE. The SF Vegan Bakesale is always awesome, but this time it is benefitting one of my favorite organizations, PAWS SF, to boot. I can not even tell you how sad I am that I can't be there. Please, please, please make me happy and go in my honor. Gorge yourself on delicious treats and support PAWS SF and feel sick and awesome all at the same time. It will be glorious!